the rikrak studio: the rikrak grand re-opening SALE! well goodness gracious great balls of fire! after a busy few months of working on various rikrak projects (more on that fun later! ), i'm delighted to announce that without further ado, my rikrak shop is now RE-OPEN! 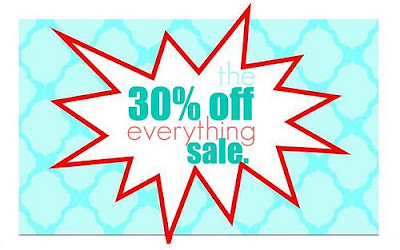 ----> everything in the shop is 30% off!<---- yippee! on now thru fri. may 21st! 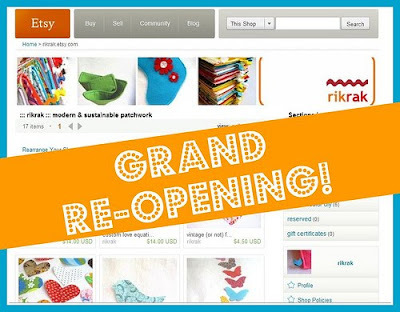 so just mention *rikrak re-opening* in your purchase note, and i'll refund you via paypal! and yay to making again. it''s been a long long while! aw thanks for the cheers, nicies! That's great, RR! Hope this means we'll be seeing great new designs from you soon.